A mighty dragon once plagued a town, preying on its children until the knight Saint George defeated the beast. The Saint George Dragon Saber is inspired by this medieval myth, featuring dragons on its sheath and a dragon shaped hilt. Beautifully ornate in antique, silvery toned steel, the dragons head and front leg make up the guard, its curved body forming the handle. Intricate scrollwork decorates the dragon in its entirety. The tail of the dragon curls downwards to protect the grip. The stainless steel saber blade itself features a slight curve and a single edge. 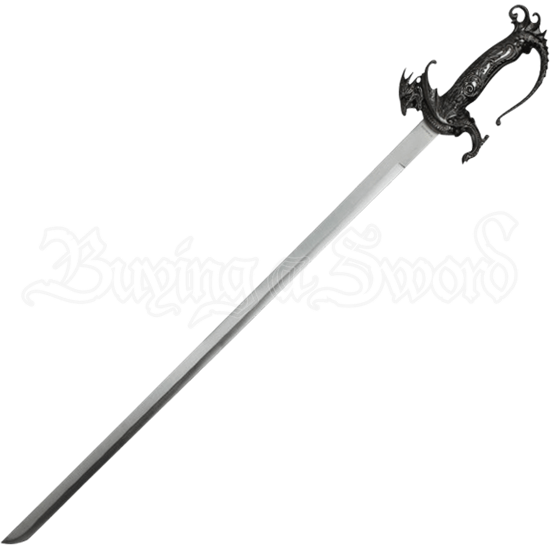 Gorgeously detailed dragons decorate the matching steel scabbard at its opening, center, and end, and a metal chain attached at the top and middle of the scabbard helps the sword wielder carry or display this fantasy blade with ease. Extravagantly detailed and inspired by historic legends, the Saint George Dragon Saber makes an outstanding addition to any sword collection or medieval themed decor.